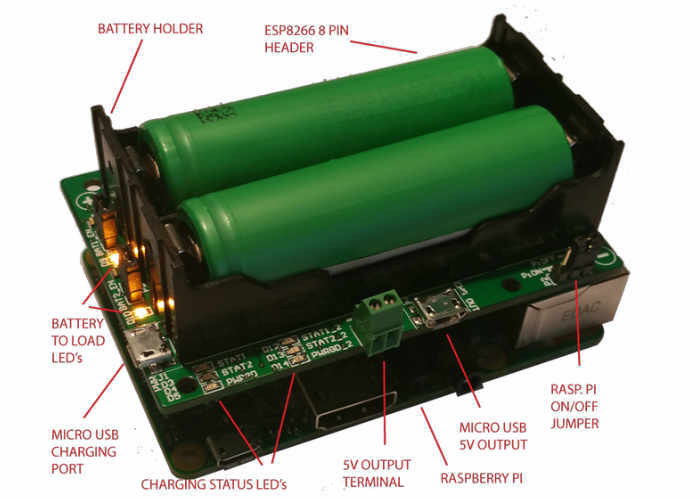 Raspberry Pi enthusiasts looking for an easy way to power their next Raspberry Pi project may be interested in the Pi18650 dual battery Raspberry Pi Battery HAT created by Mark Chin and available to back via Kickstarter with pledges starting from CAD$25. Mark has previously launch three successful Kickstarter campaigns and uses the technology from those two build this more powerful dual battery Raspberry Pi HAT that can accept two 18650 Li-Ion batteries. The Pi18650 is an add on HAT which plugs into the 26/40 pin connector on the Raspberry Pi. This HAT allows you to operate your Raspberry Pi without a power cable and can use various capacity 18650 Lithium Ion batteries. On board are two 1A battery charging circuits for charging the batteries individually. The Pi18650 development board also includes a 4×2 100mil header for use with a ESP8266 (ESP-01) wifi module for remote monitoring and CLOUD integration or a custom designed board. Included is one additional stacking header for extra clearance when stacking other HAT’s on top of the Pi18650 DUAL BATTERY HAT. How Long Can The Pi Last? As an example the Raspberry Pi Zero uses approximately 87mA without and 103mA with a USB dongle plugged in. With a fully charged single 3000mAh battery, the Pi would last 34.5 Hrs with nothing attached. Using two batteries would double the run time. Visit the official Kickstarter campaign by following the link below for more details and to make a pledge to help the project make the jump into production.